John D. Teague was born on 10 June 1856 in Cullman, Benton (later Calhoun) County, Alabama. His name was recorded as Jonathan D'Arnold by some family historians, but it is an educated guess that his middle name was DeArman for his maternal grandmother Delila DeArman. James C. Teague and Olive A. McMahan appeared in the US federal census of 1 June 1860 in White Plains, Calhoun County, Alabama. Other members of the household included John D. Teague, Nancy D. Teague, Isabella Teague, Washington C. Teague, Hettie Teague and Stacy Scott Teague. James Teague and his family have not yet been found in the 1870 census, possibly enumerated while they were en route from Alabama to Texas. According to family lore, Stacy Scott Teague came to Texas with her father "Andy" Teague at age twelve and settled in Grimes County where Richards is located today. During the summer of 1873, he was enumerated in the public free schools census in the First School District of Grimes County: John Teague, age 14, White Male. John Edwin Bay and Stacy Scott Teague appeared in the US federal census of 1 June 1880 in Montgomery County, Texas, living next to his father's sister Elizabeth Williamson.. Other members of the household included John D. Teague. He married Mary Thomas Whitfield, daughter of John T. Whitfield and Charlotte Wilkerson, on 13 December 1883 in Plantersville, Grimes County, Texas. John D. Teague and Mary Thomas Whitfield appeared in the US federal census of 1 June 1900 in Grimes County, Texas, enumerated next to J. D.'s half-brother Joe Teague. Other members of the household included Clem Boyd Teague, Floyd Preston Teague, Carrie Teague, Agnes Teague and Dink Etta Teague. John D. Teague and Mary Thomas Whitfield appeared in the US federal census of 15 April 1910 in Grimes County, Texas. Other members of the household included Dink Etta Teague. John D. Teague appeared in the US federal census of 1 January 1920 in Richards, Grimes County, Texas. Other members of the household included Mary Thomas Whitfield. He was proprietor of a general store, according to the 1920 census. He was a merchant (general store), according to the 1920 census. in January 1920. John D. Teague and Mary Thomas Whitfield appeared in the US federal census of 1 April 1930 in Richards, Grimes County, Texas. He was a house carpenter, according to the 1930 census. Two rather formal snapshots were taken of Mollie and J. D. Teague during their later years. 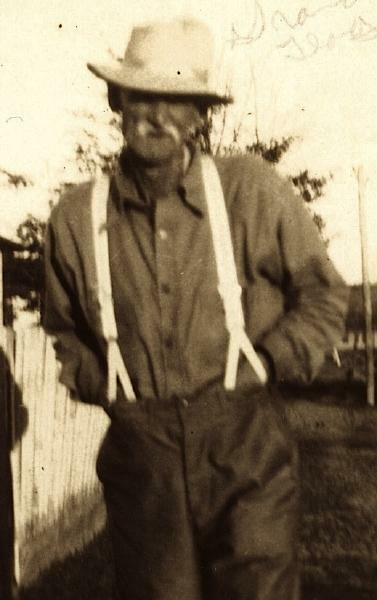 John D. Teague died on 3 April 1939 at age 82 in Richards, Grimes County, Texas. His wife Mary Thomas Whitfield became a widow at his death. The following appeared on 6 April 1939 in The Eagle: (Navasota, April 6) Funeral services for Jonathan D. Teague, 82, who died at his home in Richards, were held Tuesday by Rev. E. R. Brawner, pastor of the Richards Methodist Church. Burial was in the Fairview cemetery there. Born in Alabama, he had lived at Richards 54 years. He opened one of the first stores in that community. He is survived by his wife, two sons, C. B. of Houston and E. F. Teague of Montgomery; one daughter, Mrs. Dink Ward of Richards, and one brother, Joe Teague, of Slaton. A single grave marker identifies the graves of John D. Teague and Mary Thomas Whitfield.